The permanent miracle of Les Voiles! – Magic Carpet3 on home waters! The VOR 70 Babsy, ex Puma, sistership to Groupama IV, holds little secret for Franck Cammas. With powerful support from Lionel Péan, his men, Charlie Dalin and the bulk of Team France, the skipper of the French entry in the last America’s Cup enjoyed champagne sailing today. Third in elapsed time, the crew managed to stick with the American Maxi Rambler to take the win in corrected time. Spectre, the British 60-foot Frers-design completes today’s podium. There was an equally superb battle in each of the 5 IRC groups, with just minutes between the fifty-something footers; James Blackmore’s Swan 53 taking the bullet in IRC B. 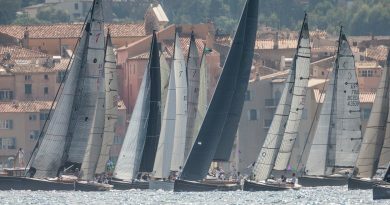 The Wally Cento Magic Carpet3 has made Saint Tropez her port of registry so winning here has a very special flavour, as evidenced by the smiles that stretch from ear to ear tonight on each of the faces of the 26 crew members. It was a battle royal on the racetrack today, with gusts of over 27kts recorded at La Fourmigue. Stellar sail changes kept this 100-footer powered up throughout, giving her the speed record for the leg with 25.6kts! This consistent performance was enough to get the better of Open Season and cross ahead of the other Wallycento Galateia just before the finish line after an epic duel. Meantime, in a debut performance, the brand new Tango really made an impression and is likely to be mixing it up with the best of them in the very near future. The 12 m JI hooked on Les Voiles. Among the strong line-up of metre boats sailing at Les Voiles, we cannot fail to mention the 12 m JIs, which competed in the America’s Cup from 1958 to 1987. Wind, sea and a great course to Les Issambres really whetted the sailors’ appetites. Sovereign got off to the best start, gallantly holding onto her lead as far as the edge of the bay. Ikra, clearly very at ease in wind gusting to 24 knots and more, snatched control of the fleet and held off France right the way to the finish line. The tone is set then, with the intensity of the racing set to build and build throughout the week. With the SW’ly wind gusting to nearly 30 knots at the entrance to the bay, the 15-metre yachts, all a hundred years old or more, weren’t treated with quite the respect they deserve. Vying for the Rolex Trophy, Hispania (Fife 1909) paid the price in the gale and laments mast damage tonight. In the name of prudence, the crew on Mariska opted to retire from the race, leaving Tuiga to take victory in this second race, seriously reshuffling the cards in the battle for the top of the leader board. For the past 20 years, Rolex and the Société Nautique de Saint-Tropez have enjoyed a privileged bond. 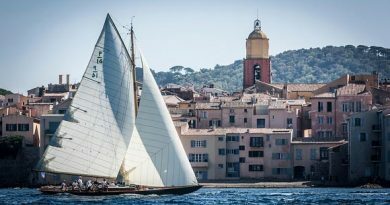 This partnership is characterised by the organisation of two major events in the yachting calendar in France, the Giraglia Rolex Cup and the Rolex Trophy, which has been part of the programme at Les Voiles de Saint-Tropez for 11 years. For the 12th edition of the Rolex Trophy, the 15MJ class is being honoured. An iconic category of classic yachts, they still sail today. 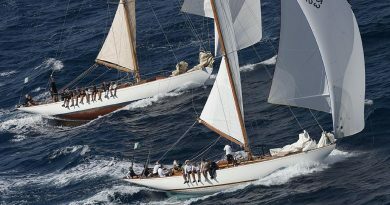 The Lady Anne, Hispania, Mariska and Tuiga have all punctuated the history of yachting competition around the world. The values of the Swiss timepiece brand, namely precision, excellence and team spirit, are a reflection of the attitude of the sailors and skippers aboard these cathedrals of sail. Rolex is the title sponsor for around fifteen major yachting events, including the Rolex Sydney Hobart Yacht Race and the Rolex Fastnet Race, two classics of offshore racing, the Rolex Farr 40 World Championship, a top-flight one-design competition, not to mention the Maxi Yacht Rolex Cup and the Rolex Swan Cup, two particularly spectacular maritime gatherings. The brand also supports World Sailing and a host of prestigious yacht clubs around the world, including the New York Yacht Club in the US and the Royal Yacht Squadron in Cowes, England. This year, Byblos Saint-Tropez is celebrating its fiftieth anniversary; 5 decades of inspiration and splendour! In the space of just 5 decades, Byblos and the Caves du Roy have become an absolute legend through their history, the passion of their owners – the Chevanne family – the loyalty of their staff, the specificity of their clientele and the prestige of their partners. Witnesses and precursors of the latest trends, the two establishments positively cultivate the luxury of an art of French-style living. Their timelessness is all part of their charm. Never copied or duplicated, Byblos luxuriates in its 17,000m2 space, reinventing modernity by equipping itself with all the latest technologies whilst retaining its unique and indelible cachet. A new generation of rooms now exists with the same eye for detail and uniqueness. Ever greater and more glamorous, they offer contemporary decoration with an eternal charm, utilising the latest technologies to satisfy the desires of an international clientele familiar with the most beautiful palaces on the planet.